Eric Metaxas’ biography of Dietrich Bonhoeffer was a book that I was eager to read. It finally made its way to my reading list courtesy of Father Christmas and I made good use of the holiday season to dive in. I first became aware of Dietrich Bonhoeffer through his book, The Cost of Discipleship. Held in high regard by many Christians, Discipleship takes the role of the Christian seriously, managing to walk that tight line between highlighting the requirement of good works in obedience and the act of salvation which is only through God’s grace. Being a Christian has implications; being a Christian brings action with conviction. Discipleship in many ways portrays the life that Bonhoeffer himself led. Eager to find out more about the man and how he fit into, and indeed shaped history, I started ‘Bonhoeffer, Pastor, Martyr, Prophet, Spy’ with enthusiasm. From the moment I entered the pages I knew that Metaxas had done his homework. This is not merely a salute to a personal hero with a few gaps filled in. No, this is clearly the product of much research into Bonhoeffer’s life through the dissemination of as much information that can possibly be found about him. From personal letters to all sorts of interesting people to essays and positional pieces on the state of the church, the reader is afforded a close look at the world that Bonhoeffer occupied. However, at this point I must sound my first note of concern. This may merely turn out to be stylistic, and a matter of personal taste, but it bothers me enough to mention it. One aspect of a well-written biography that I enjoy is the chance to see the world through the eyes of the subject of the book. To experience the relationships, the geography, the politics and prevailing thoughts of the day. Bonhoeffer was brought up and educated in Berlin, a centre of learning, high thought and excellence. With strong links to pre-Great War Germany and keeping with the traditions of 19th Century Europe, Berlin was at that time a city of high culture and nobility. Through the great use of correspondence and with an awareness of the historical scene at large the stage is set and the reader is invited to participate in 1930s Berlin, only then to be yanked back to the present day by sloppy colloquialisms from Metaxas. There is a light-heartedness in the style of writing that makes Metaxas very readable and yet at the same time almost unsuitable for critiquing this period in history. One could indeed argue that this is a book written for an audience today, merely peering into a window in history. Yet if we are to judge history by today’s eyes alone are we not acting in snobbery in assuming that we, living in the present, are more enlightened by the mere fact that we came after the events we are studying? Moving on from the style, the substance of the book is reflective of the obvious research that has gone in to this work. The relationships that are essential to the character development of Bonhoeffer are teased out in a fashion that show clearly the pieces of the puzzle coming together at key times in Bonhoeffer’s life. From his close friends and family at home in Germany, to his friends abroad throughout Europe and particularly in England and the US we see the development of a man and the thought processes which ultimately shaped the direction of his life. We are privy to the dreams and hopes of Bonhoeffer – which surely make up as much of a man’s personality as his actions. Indeed, we see how his actions are directed by his aspirations and to separate the two would present only half of the truth. 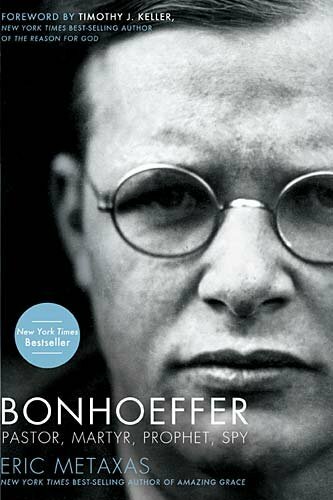 Metaxas labours to spend time on the formation of Bonhoeffer’s character before World War II, where Bonhoeffer would ultimately make his name in defiance to both the German church and the Nazi regime. We see the development of intimate discipleship groups – the formation of which brought back something lost to the Western church for a great number of years. We also see the deep relationships that were forged which would ultimately be of assistance to Bonhoeffer and many varied ways. Some of the overall history, especially towards the end of the book during World War II flirts with revisionism but that can be forgiven with the understanding that the author, much as the reader will be, is caught up with Bonhoeffer as the central focus of the story. By the last few chapters the reader does indeed begin that he feels like he knows Bonhoeffer and this emotional investment can change how the reader sees the overall global historical picture. It is on that last point that I conclude. Metaxas may employ a different style of writing than my personal preference and may depart from the historical record on occasion. He may even make some theological errors, although that is not for me to comment on. However the reader is left at the end feeling that he has made a friend in Bonhoeffer. Through the piecing together of the intimate and profound moments of Bonhoeffer’s life we are left with an empathy for this brilliant, passionate, affectionate and courageous man who whichever way you read history has left his indelible mark upon it.